The Kalachakra tantra belongs to the “unsurpassable” Maha Anuttara Yoga class of tantras and thus contains the most subtle instructions on the achievement of Buddhahood. Kalachakra means “Wheel of Time.” Its outer meaning deals with the universe and all traditional sciences such as astronomy, astrology, mathematics and medicine. Its inner meaning relates to the human body, its internal structure and subtle energies, to be developed through yogic practices. Its secret meaning refers to the complete cycle of study and practice of tantric meditation on the Kalachakra yidam and it’s Mandala. This particular initiation of Kalachakra granted by H.H. 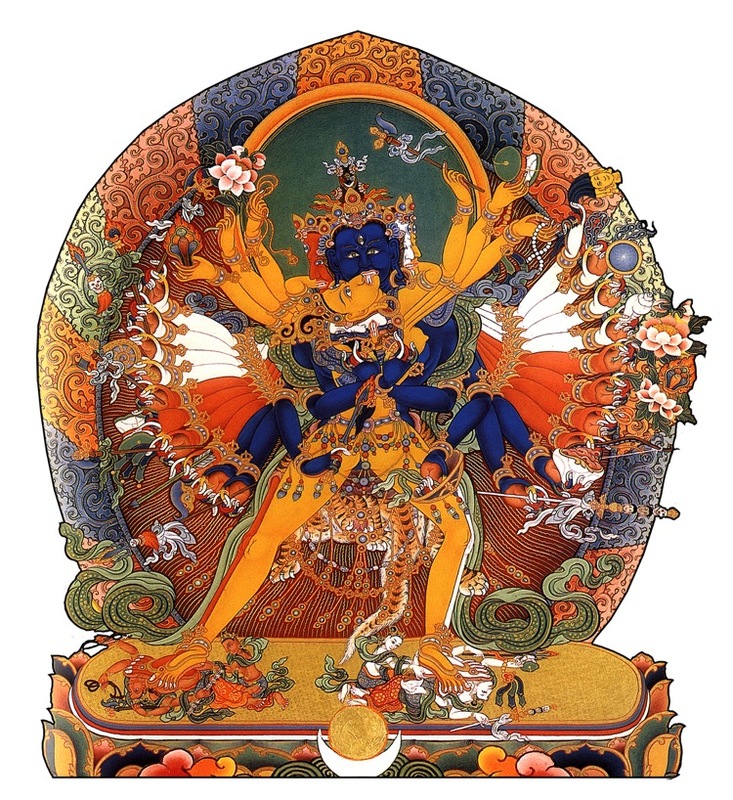 Sakya Trizin belongs to the Vajramala collection of the great master Abhayakaragupta. The event took place at the Great Hall in Kensington Town Hall on Hornton Street over two days, chosen by H.H. Sakya Trizin as an auspicious time. 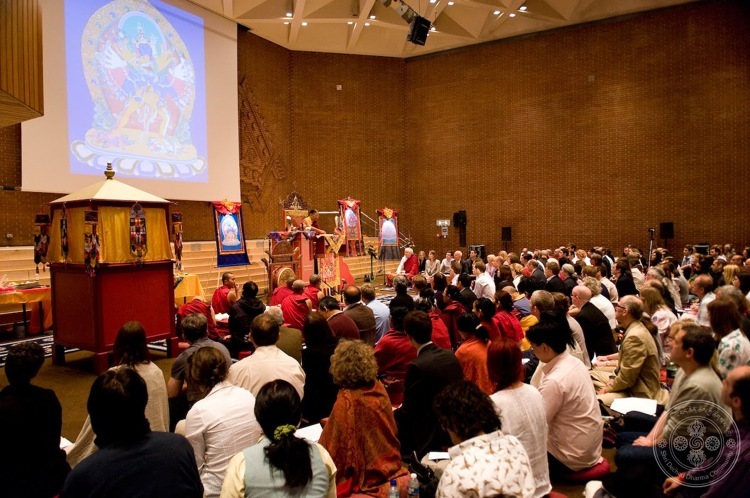 The event was attended by over 500 people from many traditions of Tibetan Buddhism. On Monday 14 June an introduction was given by H.H. Sakya Trizin, and the preparatory part of the initiation took place. On Tuesday 15 June the main part of the initiation was completed. On each day the traditional symbolic offering of body, speech and mind was made to H.H. Sakya Trizin, on the first day by Lama Jampa Thaye and on the second day by Lama Ole Nydahl. The conclusion of the initiation saw Lampa Jampa Thaye give a short speech rejoicing in the visit of H.H. Sakya Trizin and making wishes for his long life. Lama Ole, Caty Hartung, and the Diamond Way sangha expressed their gratitude to H.H. Sakya Trizin and Lama Jampa Thaye for sharing these two marvellous days together. By receiving the initiation, those present established the imprint of future rebirth at the time of King Rudra Chakrin, the 25th King of Shambhala. Shambhala is said to be a “Pure Land” within our world, only to be perceived by beings with a pure mind and the right karmic connections. When disasters caused by disturbing emotions will affect the Earth, it is prophesised that Kalachakra, as Rudra Chakrin “King of the Iron Wheel”, will manifest again in our world. At the end of a spiritual war against retrograde forces of suppression, he will establish a reign of happiness, free of confusion and suffering. Lama Ole Nydahl himself is a holder of the Kalachakra transmission, having received the full empowerment in Karma Guen in 1994 from Lopön Tsechu Rinpoche who was a holder of all Kalachackra lineages. This time last year Lama Ole participated in the Kalachakra Initiation given by Beru Khyentse Rinpoche in Karma Guen and later this year together with Lama Chogdrup Dorje he will inaugurate the Kalachakra Stupa at Karma Berchen Ling in Greece. After the two days of the initiation with H.H. Sakya Trizin, Lama Ole stayed in London for another two days, when he had meetings with members of the Buddhist community as well as his students from London and surrounding groups and centres. This entry was posted on Monday, June 21st, 2010 at 12:25 am and is filed under Diamond Way Buddhism, Event Reports, Lama Ole Nydahl. You can follow any responses to this entry through the RSS 2.0 feed. You can leave a response, or trackback from your own site.